Keep your clients guessing what your next fun promotional toy will be. Your company is cool and funky and you always come up with great ideas. Our little stress man is your next great idea. Stress toys are the in-thing. Fun Reminder to Keep in Shape! They are great for your health and well-being and also keep your hands in good shape as you exercise them. Getting away from stressful situations during working hours is not always possible and grabbing a stress toy can help there and then on the spot. Play with it at your desk, in a meeting or at the coffee machine. You will feel a whole lot better. This quirky little man is made from a strong and pliable material. He comes in a bright sunny colour and has two big feet and two arms. His round head is cute with a huge smiley mouth and dark eyes. Dressed in a t-shirt in a bright contrasting colour, he will look great when branded with your company logo. Our listed price includes branding of your logo or graphic in a single colour print onto the men via a pad printing process. Hand them out at trade shows, expos and outdoor events. They are also great for parties and year end functions and will add a frivolous vibe to the event. We offer a product turnaround time of two weeks, but we can offer even faster turnaround times for urgent orders. Please note that our prices exclude GST and a print set up of $75 applies. This product is supplied in bulk quantity only for custom branding, making it ideal for large promotions. 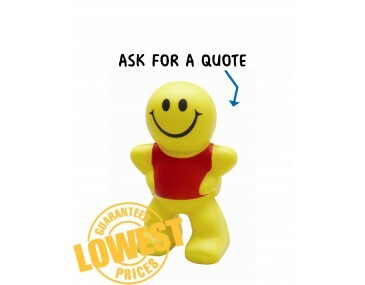 This funny man stress ball can be personalised with your branding in additional colours. For additional spot colour prints via pad printing this can be accomodated quite easily and prices can be viewed below. Alternatively we can also supply this stress ball with a full colour digital print transfer. For prices please see the table below. Please contact us for a proper written quote on a letterhead.